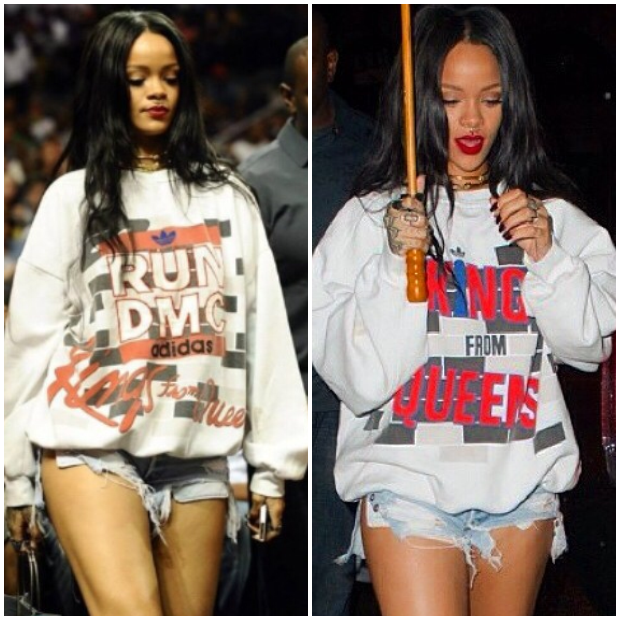 The beauty Rihanna was spotted out and about New York on Thursday rocking these two Adidas sweatshirts. On the upper left Riri wore a grey Adidas Run DMC, named after the famous rap group. The second, on the upper right, was a Kings from Queens Adidas original. But don’t get your hopes up guys. The shirt is vintage dating back to the 80s during the height of the group’s career. This means the shirt will be hard to come by, and, if you do expect to spend a pretty penny. Rate the look Fashion Debunkers! Love it, Like it, Leave it? !